Over the past year I never really thought about the movie again, it seemed to have been something that came and went, just another not-quite summer block buster. Then about a week ago my sister and I were bored and she said to me, “Hey want to watch Maze Runner?” I said, “Sure.” It turned out to be a good decision. We started up the movie expecting the worst, it didn’t get very good reviews, but we had nothing better to watch and my sister has an affinity for Dylan O’Brien (Thomas). Who some may know as the nerdy-cute side character from Teen Wolf, who seriously needs to update his IMDB photo… I was more excited when about seeing Thomas Brodie-Sangster (Newt), who is always adorable and whose untimely, rather ill-written death on Game of Thrones made me miss him. Then Ki Hong Lee came jogging onto the screen. Neither of us had ever seen or heard of him, and we both immediately thought: They are totally going to kill the Asian guy first. To our surprise and delight, they didn’t. It was a ginger who was first to go. About half-way through the movie my sister and I were shocked: Why hadn’t more talked about this movie? Something about this has to get bad soon right? It’s been good so far, what’s the catch? Turns out there wasn’t one. By the end of the movie we were a bit confused: This movie is good, but it can’t be over, there has to be a second one right? A short amount of google searching later we found that there is indeed a second Maze Runner, and lucky for us, it opens in theaters on Thursday September 17th. Okay so The Maze Runner was not without it’s own flaws, but they were minimal compared to most big-budget, geared for teen, movies these days. What really caught me off guard, besides Minho lasting the entire movie, was that this was one of the VERY FEW movies that did not revolve around some type of romance. Sure there was a girl added towards the end, who hilariously sits up in the watch tower throwing rocks and sticks at all the other boys. It was super refreshing to see a female character whose sole purpose was not to add sexual intrigue, though I suspect some romance may occur in movie 2, there was no hint of it’s development or importance in the first installment. 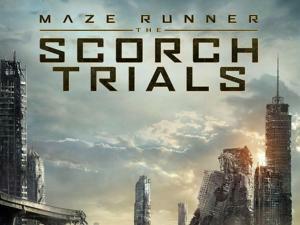 Another thing I found surprising was just ruthless The Maze Runner was. Want corny, happy endings? Don’t look for them here. Again, this was a nice change of pace from the usual endings of an action flick, made for teens or not. Part of me was super glad I had waited the year to watch this one, because now I really want to know what happens next, and gladly, I won’t have to wait very long to find out! So if you have nothing to do in a couple of weeks, and are craving some good action, watch The Maze Runner, you might end up just as surprisingly not-disappointed as I was. This article was written by Alethea Cho, a writer for dusk magazine.